This June, as a central feature of Cider Week Hudson Valley, 19 craft cider producers around the region will offer first sips of limited edition ciders in situ. Made from 100% New York apples, Destination Ciders reflect versatility, creativity of the cider makers and the terroir of the natural environment from which these ciders emerge. The Hudson Valley’s renaissance beverage is as complex as it is delicious; extending the opportunity to discover this first-hand is an important goal of Glynwood as Cider Week’s founding sponsor. These unique bottles and barrels will only be available on-farm during Cider Week, an exciting development for an event that has been showcasing local cider’s distinctiveness since 2010. Cider Week’s special tasting opportunity was the brainchild of participating cider maker, Karl duHoffman of Orchard Hill Cider Mill. With his extensive background in spirits, Karl was keen to recreate the sort of experiences he’d had in Scotland and elsewhere that offered visitors the chance to sample new, rare and exclusive products only accessible at the places where they are crafted. Whether it’s a new release, an experimental batch or a vintage in such small quantities it will not be widely available on the market, each Destination Cider builds on enthusiasm for trying regional craft ciders by tapping them at their source. No Destination Cider has been tasted before, adding excitement to the exploration. While refreshing like a quality craft brew, hard cider also possesses all the nuance and beauty of its closer cousin, wine. Visiting Hudson Valley farms and cider mills is quite common in autumn, around harvest time when the apples are pressed, but Cider Week Hudson Valley encourages tourists and residents alike to hit the cider trail now. New bottlings are released in spring and summer, making the month of June a prime time to sample the fruits of last fall or last year’s labor. Whether aged for many months or fermented for just a few, there is nothing quite like tasting cider straight from the barrel. In addition, the celebration’s early summer placement intentionally works to subvert the notion that fermented cider drinking should be restricted to colder months, and expands awareness that cider comes in a range of styles and flavors that pair extremely well with food across the spectrum, year-round. If you’re already accustomed to vineyard hopping in the Hudson Valley or elsewhere, consider adding orchard hopping to your resume of summer activities. What better time to get acquainted with the diversity and charm of farm-based cider than on a lazy summer afternoon? In fact, pick up a Destination Cider Discovery Pass, which offers 1 glass of cider at up to 6 participating tasting rooms (6 ciders total) for $25 (tasting are available during regular business hours; please check each cideries website for details). Pick a handful of cideries, fire up your GPS, and hit the blue highways up and down the river. 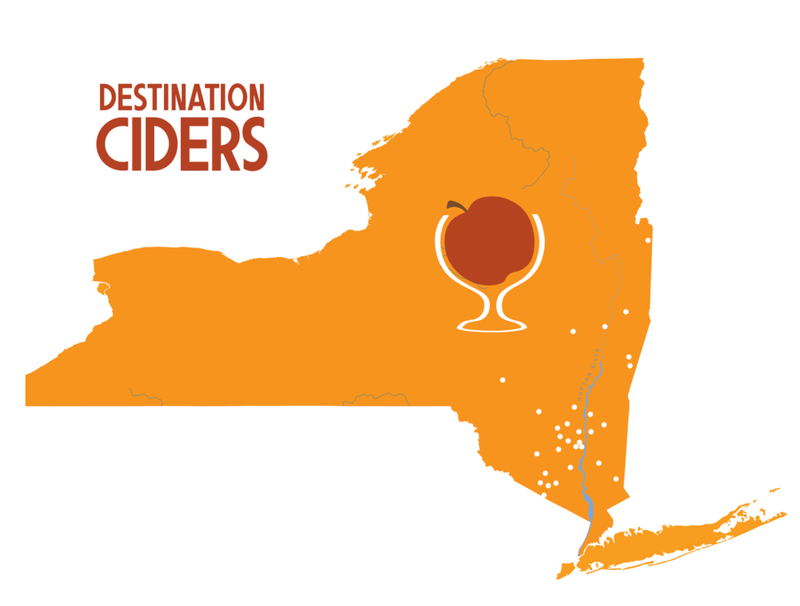 Hudson Valley cider makers are eager to welcome you, making this one roadtrip sure to quench your thirst for fermented adventure.